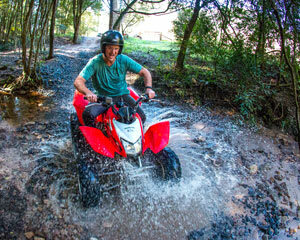 You could effortlessly choose from an endless list of Adrenaline charged experiences. Put yourself in the picture and you’ll also lean towards more romantically inclined encounters, on land, water or high in the sky. For unforgettable experiences to share or go solo, there is hot-air ballooning, tandem skydiving, rally driving and V8 experiences, helicopter rides, sailing, indoor skydiving, scenic and aerobatic flights (for high fliers wishing to channel their inner Wright brothers). 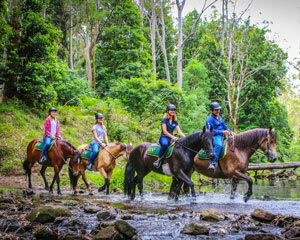 If you’re leaning towards something more low-key and land-based, guys and their gals can saddle up in a memorable horse-riding experience. There’s also canyon explorations and quad biking for the more adventurous, and European Super Car packages for the ultimate in super-powered luxury cruising. 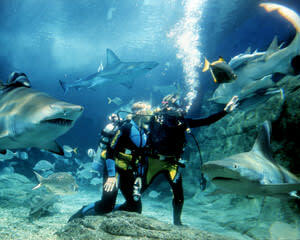 Plunging into the deep blue sea is also achievable with a range of thrilling shark and dolphin swims. There’s also snorkelling day cruises at the Great Barrier Reef, which makes for an unforgettable experience for marine-life lovers. Or skirt on water at rip-roaring speed on a jet-boat ride or Jet pack and fly-board experience. All of these expertly tailored and curated experiences as well as much much more are available at major locations and centres throughout Australia. So nobody need ever miss out, especially not the all-important man in your life, when you turn to Adrenaline for your ultimate gift-giving ideas. For the man who has it all, and particularly you, pinpointing the perfect presents have innumerable challenges and rewards. A gift card is a great start. Adrenaline innately knows that good things come in small packages. An Adrenaline gift card can be made out to any denomination, instantly emailed to that special man or express delivered in an impressively presented brushed-metal gift box to their door. The gift cards cover all of the experiences and packages offered by Adrenaline and, conveniently, are valid for three years. This means that busy blokes need never miss out on seizing the perfectly tailored experience for them or to share with their beloved ones. These gift cards are ideal for absolutely everybody who yearns to realise their inner-adventurer dreams. An Adrenaline gift card is sure to have a big impact on Dad or hubby, as they make the ideal Father’s Day, birthday and all special-occasion gifts. Speaking of Father’s Day, Adrenaline has a comprehensive online catalogue for the most inspirational gift ideas on Dad’s special day. Some of these could include flight simulators, abseiling, treetop walks and so much more. There’s something to suit every taste — from mild to wild! Send Dad (and Mum) on a horseback winery tour, have him riding a Segway or try his hand at a fun-filled BBQ cooking class. There’s an endless choice of ideas for Father’s Day at Adrenaline. What’s more they’re priced to please all budgets, with surprising affordability for giving the unforgettable gift. Experience gifts for men who have it all include the V8 Drive and Hot Laps (front seat), seven laps combo at Sandown Raceway in Melbourne (and other renowned Australia-wide race tracks). This white-knuckle experience features driving one of the most powerful 450Hp V8 vehicles in the country for four laps and your professional racing car instructor will take over for three of the hottest laps of his life. 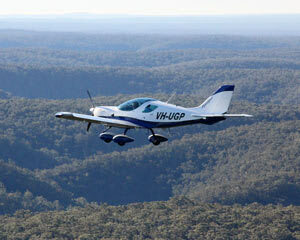 Still in V8 mode, aim for an exhilarating Jet boat ride (one hour) at Surfers Paradise, and elsewhere. As the engines roar into high-powered action, your V8 jet boat pummels across the water at speeds of up to 80km per hour. What are must-have presents for men? A little bit of luxury goes a long way when it comes to the most coveted gifts at any time of year. 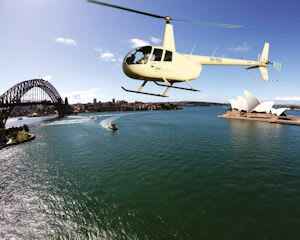 Luxury gifts for men abound at Adrenaline, including a range of mesmerising scenic helicopter tours. The best-selling helicopter scenic flight for two (30 minutes), high above Olympic Park and Sydney Harbour, includes the added bonus of a third person flying free. Taking off in a modern Robinson helicopter on your private flight, enjoying views of the iconic Harbour Bridge and Sydney Opera House are sure to add thrill-seeker sparkle to any occasion.What’s more, every passenger in a Robinson helicopter has a window seat, so there’s never been a better incentive to see the spectacular Sydney skyline with your head in the clouds. 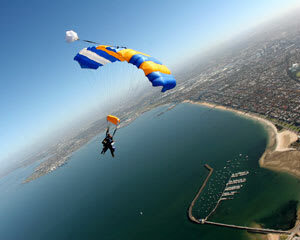 Top birthday gifts for men are also a hallmark of the Adrenaline experience. For another touch of sky-high luxury, the Hot Air Ballooning Barossa Valley, Adelaide, experience makes for a memorable birthday gift or the perfect Valentine’s Day gift idea. Wine lovers and sightseers alike will revel in a tranquil sunrise flight, floating high above the spectacular and world-renowned wine region. Snuggle up to your guy on ‘cloud nine’, as free as two lovebirds for your one-hour joyride, before coming in to land and indulging in a sumptuous gourmet breakfast and glass of sparkling wine at one of the region’s premier restaurants. This breathtaking gift experience is pure bliss for an unforgettable taste of living in the lap of luxury. What are some good gift ideas for men? “If you love somebody, set them free,” was penned in the 1960s, but the sentiment still stands. 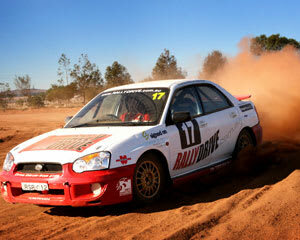 Great gift ideas for blokes who enjoy hanging with their motorsports-loving buddies include rally driving, off-road racing, V8 and European Supercar driving experiences. If he happens to possess a little too much get up and go, a defensive driving course also makes a practical and thoughtful gift idea for your inveterate rev-head. He will thank you for it once he masters the mettle of not putting pedal to metal. Beer tasting and gourmet-lunch experiences, at premium breweries and restaurants throughout Australia, are designed for sharing in a spirit of fun. Why not throw in a Harley ride for added wow-factor excitement? He will love you even more for the Adrenaline-charged rush. Solo types would thrill to a little combat-style action. Your skyward-bound adventurer will be in seventh heaven with the Black Ops military helicopter flight in Sydney, which even includes Go Pro footage. His mission, should he choose to accept it, is to strap himself into one of the most dynamic helicopters in creation: the jet-powered McDonnell Douglas 500E (MD500E). This unique package is for one flier and features a 20-minute flight aboard the legendary aircraft made famous in cult film “Apocalypse Now”, “The Italian Job” and, of course, “Mission Impossible”. The best-selling flying lesson with aerobatics (45 minutes), in Sydney, Melbourne, Brisbane and other centres, which is designed for the potential pilot in your life, is another ideal high-flying gift idea for men who have the lot.